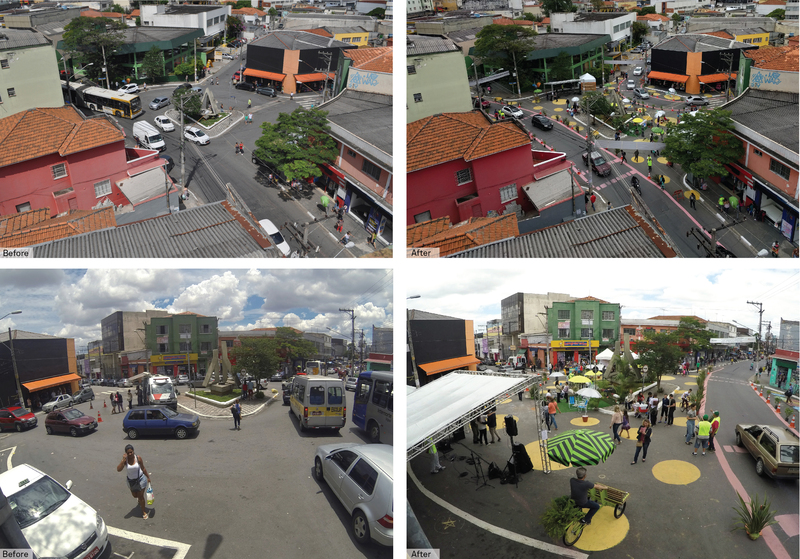 ‘It is not a question of engineering or funding but a strong will to make our streets safe that matters!’ Sao Miguel, an eastern district of Sao Paulo attested to this statement by transforming an intersection that only served cars to a safe place for people in 5 hours. 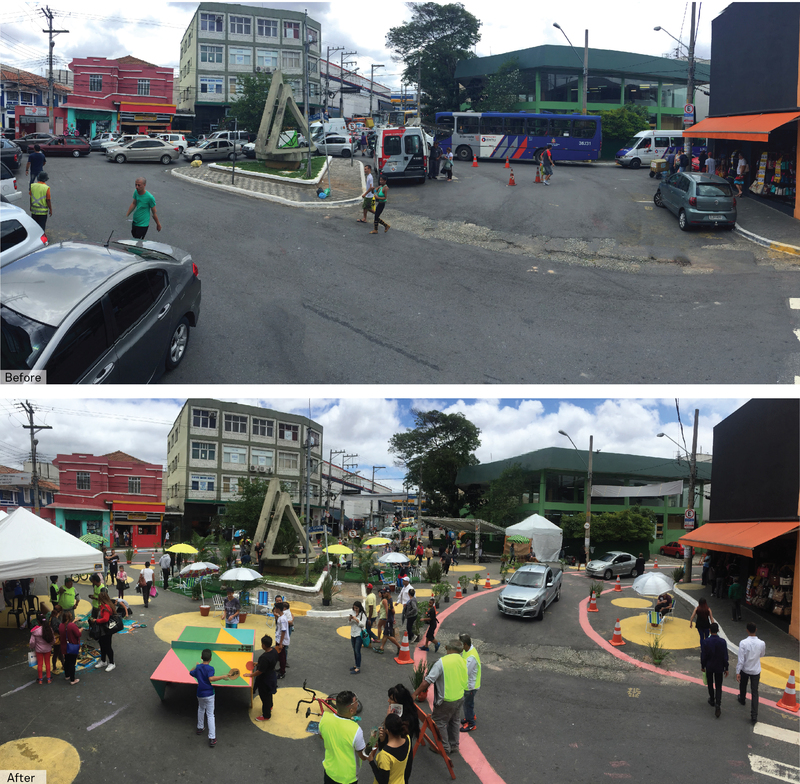 As a part of the community outreach efforts for Area 40 – Reduced Speed Zone Redesign, under Bloomberg Philanthropies Initiative For Global Road Safety (BIGRS), NACTO-GDCI with the support of other partners organized a one day pop-up transformation event – “Sao Miguel Mais Humana – Rua Para Todos”. 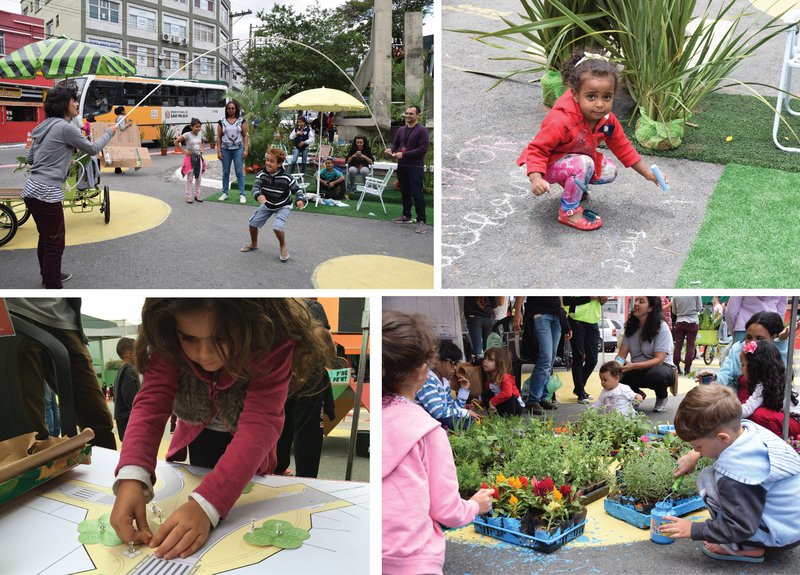 An area of 1600 Sq Mt, in Praca de Getulio Vargas–a dysfunctional roundabout and a large bed of asphalt, was temporarily transformed into a pedestrian plaza with narrowed travel lanes and additional pedestrian crossings with the use of chalk, paint, cones and planters. The space was activated by artificial turf, beach chairs, umbrellas, planned activities of children and music for adults through the day. Making their way to Sao Miguel at the break of dawn, NACTO-GDCI team and the BIGRS embedded staff worked with 20 other collaborators to change the street geometry, with a tight timeline of 5 hours. The intervention was based on the proposed design for Sao Miguel Reduced Speed Zone which is currently under the a review phase. It eliminated two vehicular alternatives, in turn creating additional open and safe space for pedestrians. The geometrical changes on the intersection were achieved with the use of chalk to mark the new geometry, followed by panting the outline with gypsum based-paint, and finally placing planters and traffic cones to increase visibility of the new geometry. The reduced speeds and increased visibility for all users ensured that vehicles yielded to pedestrians trying to cross the narrowed travel lanes. A 30% reduction in average vehicular speeds was observed, making the intersection safe for shared use. The increased space for pedestrians and the programmed activities ensured the plaza served users of all ages and abilities. The use of artificial turf, umbrellas, beach chairs and music, helped activate the plaza, while the ping-pong table and the jump-rope were extremely popular with the younger citizens of the community. Placed alongside the information booth, was the activity booth that hosted activities such as planter painting and design your own plaza attracting age groups from 3 to 65. São Miguel, a vibrant commercial district of São Paulo, was selected to be the first area for design implementation through surgical streetscape interventions like additional pedestrian crossing, narrowing travel lanes, sidewalk widening, raised crossings among other traffic calming strategies. The delineated area in Sao Miguel’s Reduce Speed Zone has been notoriously know as the most un-safe neighborhood with 734 crashes per Sq Km compared to the city average of 23 crashes per Sq Km. NACTO – GDCI along with other partners under BIGRS has been proving technical assistance to the City of São Paulo for redesigning it’s the Reduce Speed Zones, since early 2016 and this event was planned as a part of the Area 40 – Reduced Speed Zone Redesign for Sao Miguel. NACTO -GDCI places a strong emphasis on collecting data to evaluate the design changes and most importantly to allow the community to voice their opinions. At the end of the event, almost 100 surveys were collected and an overwhelming majority (97%) of the people who participated in the survey reacted positively, expressing interest in increasing safety, public space and having out-door events in the space. Pop-up street transformation like these can be achieved in a few hours, provide instant safety to road users and help build support for capital funding by showing ‘Whats Possible’ to both the community and the city agencies. This event was planned for a day, however the materials used could have been applied for a longer duration if needed. We cannot afford to wait in taking action to reduce road traffic fatalities, and this event was a testament to it. With the will to change our streets, we can transform the most unsafe intersections to the safest ones, in a matter of few hours. The time to act is NOW. 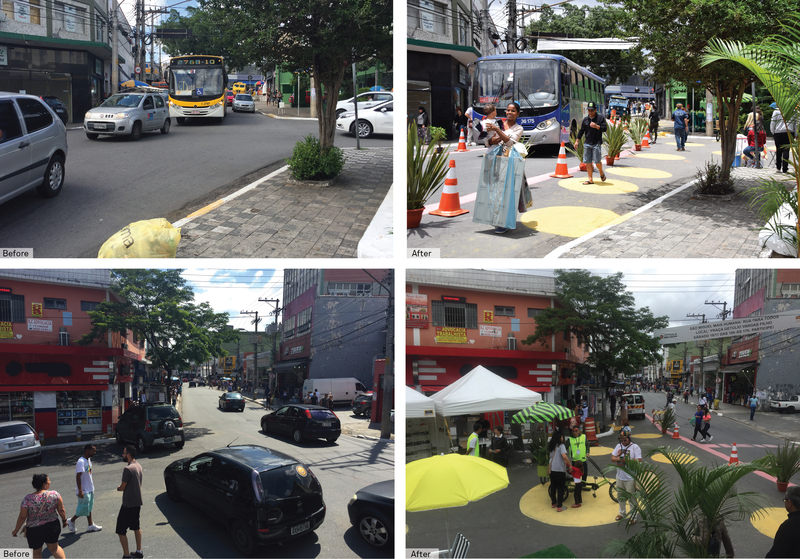 NACTO- GDCI will continue working in the Sao Paulo’s Reduced Speed Zones in 2017, and support the efforts towards community outreach and data collection to ensure that just like ‘Sao Miguel Mais Humana – Rua para Todos’, we design streets that put people first! The production of the event was held jointly with the São Paulo city government, Bloomberg Philanthropies Initiative for Global Road Safety, MobiLab, Companhia de Engenharia de Trafego (CET-SP), Vital Strategies, ITDP Brasil and Citi Foundation. Additionally, the Commercial Association of São Paulo – São Miguel District, ANTP, Bijari, Cidade Ativa, Jovens do Brasil, Pingpoint, Red Ocara, Scipopulis and Urb-I collaborated on this project.